Radio Sputnik discussed a statement by Vil Mirzayanov, a Soviet chemist who claims to have been involved in the creation of Novichok nerve agent, that weather in UK was too humid to allow for the use of the agent the day Sergei Skripal was poisoned, with Anton Utkin, former UN chemical weapons inspector in Iraq. Vil Mirzayanov, a Soviet chemist who claims to have been involved in the creation of a deadly toxic agent, told Kommersant FM that 'only an idiot would have used Novichok nerve agent in humid conditions'. Mirzayanov explained that Novichok is apparently very unstable and vulnerable to water. And since the weather in England on the day Skripals were allegedly poisoned was humid and foggy, the chemical's potency was greatly reduced. Anton Utkin: Everything that we know about Novichok type agents came from Mirzayanov's book where he provided us with eight structures. But actually 10 years before his book the structures of Novichok appeared in National Spectral Base list of the United States. And one year before Mirzayanov's book Hank Hellison published his "Handbook of Chemical and Biological Warfare Agents" where he provided over 50 Novichok structures. So Mirzayanov wasn't the first guy who published the Novichok structures and actually from the beginning all his statements were very contradictive. First he said that only Russia could produce Novichok type agents but after the information about a number of countries who produced Novichoks became publicized, he changed his opinion. After he learned that Hungary, Czech Republic, the United States, Iran, Italy, actually produced these chemical agents he said, "Well, every laboratory can produce it." He also stated that there's no antidote against Novichok but after Skripals were fine and didn't die I haven't heard anything from him but that's a contradictive statement. I can continue all these contradictions but let's consider his last statement, that Novichok actually isn't stable in humid conditions. First of all, second generation agents like VX can contaminate open areas for weeks and for months. This is one of the characteristics of warfare chemical agents — it should be persistent, otherwise it's not a chemical agent at all. And now we learn from Mirzayanov that a fourth generation chemical agent, warfare chemical agent, is actually not persistent in humid conditions. This sounds… [absolutely] absurd and at least it says that we're talking with not a professional. Sputnik: Can you tell us about the Novichok, the destruction of Novichok-like agents in the Soviet Union? Anton Utkin: I can assure you that there were no Novichok arsenals in the Soviet Union or in Russia. I handled the destruction of all chemical agents in the Russian Federation, it was about 40,000 tons of chemical agents in total. And I've never heard of any Novichok type agent in Russia or structures like those that were published by Vil Mirzayanov. Sputnik: Having access to these structures how easy is it for somebody to create this substance? Anton Utkin: When I see these structures I actually think that there's no specific difficulty in producing these kinds of chemicals. The only thing that you need is a competent chemist, synthesis and a laboratory, that's it. Sputnik: What's your bottom line on Novichok? 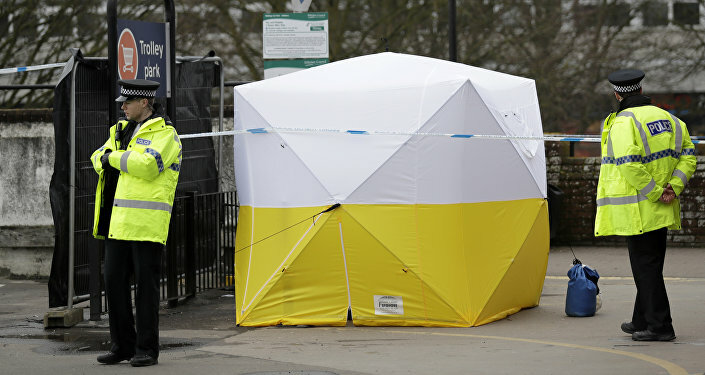 Whether or not it existed, where it existed, could it have been obtained or manufactured and how did it come to… do you think that the Skripals were subjected to a Novichok type poisoning? Anton Utkin: We know as a fact that several countries produced Novichok type chemicals. This is not just an assessment. It's confirmed by their publications in the scientific literature. All this fuss about the Novichok is done due to the fact that the UK wanted to aggravate to make this Skripals case to be associated with chemical weapons. Why? Because actually when one person is poisoned it's a criminal case so there's no need to talk of chemical weapons. Why? Because a chemical weapon is a weapon of mass destruction and if somebody tries to kill a thousand people, so now we can talk about chemical weapons. But even if a chemical agent is used as a poison, it's still a criminal case like the brother of Kim Jong-un, the leader of North Korea, was killed with a warfare chemical agent, real warfare chemical agent VX, but nobody tried to use the Convention of Prohibition of Chemical Weapons in that particular case; it's criminal. Sputnik: How effective is that I mean when you talk about military grade nerve agents, what's their goal? You said they're effective for weeks and how soon is death usually imminent? Anton Utkin: If a person is exposed to a chemical agent, warfare chemical agent like sarin or VX, it takes several minutes for an antidote to be injected otherwise this person is gone. We learned from the mass media that sergeant Bailey found Skripal unconscious. This means that if they were exposed to the weapon grade agent […] This means that the antidote would be necessary to inject within seconds and when the sergeant called for an ambulance it took at least 10-15 minutes for the ambulance to come. So it's impossible when people are unconscious from nerve agent exposure warfare that they would be saved after 15 minutes.